JHD type drum yeast dryer is a single cylinder dryer, can be used for drying of various kinds of slurry, especially for recovery of the waste yeasts in brewhouse, dryers of different specifications can meet the production demand of brewhouses at the scale of annual 30,000 tons to 100,000 tons of beer. This machine is also suitable for the drying treatment in food, chemical and medicine, etc. 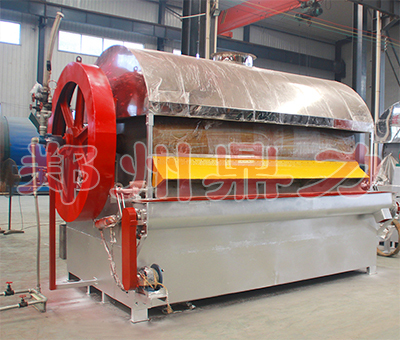 JHD type drum yeast dryer body mainly consists of dryer cylinder, frame, driving system, scraper, limited material, scraping device, leaching material device and steam-path system. In addition, it is equipped with electrical control cabinet and exhaust steam cover. This is a kind dryer that heats the material and evaporates the moisture by indirect heating of steam. Its dryer cylinder ( drum) is a metallic hollow cylinder whose surface is finished and is extremely smooth, driven by the transmission device (gearwheel and pinion), the dryer cylinder rotates in axial direction and the speed can is adjustable. The slurry is preheated in preheating tank, when heated to about 50℃, the slurry will be pumped to the leaching material tank at lower part of the drying cylinder, the drying cylinder submerges about 60-80mm depth, then the surface of the rotary cylinder will be coated with a layer of uniform slurry (the thickness of the film), the steam pressure in the dryer cylinder is 0.15-0.3 Mpa, the slurry is heated on the outside surface of the dryer cylinder, the moisture be exhausted by induced draft fan after evaporation. The drying will be finished when the dryer cylinder rotates one circle, the material piece on the external surface of the dry cylinder is scraped with scraping device and falls to the discharge port for collection. The dryer cylinder in contact with the material is made of high grade cast iron subject to ground finishing, with characteristics of anticorrosion and free pollution. This machine adopts conductive heating, there's no heat loss taken by the drying medium, so it is high heat utilization and low energy consumption, usually above 70%. It is also characterized by compact structure, less room taking and convenient cooperation and maintenance, etc. This machine is made by combining with the advantages of the Germany sample machine and in light of the actual situation in China, advanced operational performance is achieved.